Pricing is dependent on the type of lesson that is requested. Email luvjoyseamon@gmail.com for a quote. Are you interested in coaching on perfecting a specific skill or technique? Looking to try out a new apparatus? Can’t make it to regularly scheduled classes? Private lessons might be right for you. Luv is available to teach private lessons or small group classes that are specifically tailored to the needs of the group or individual on a variety of apparatus. Whether you are looking to clean up your basic skills and transitions, or to add some new skills to your repertoire, Luv can offer specific coaching to help you achieve your goals. Luv has been dancing for as long as she can remember. 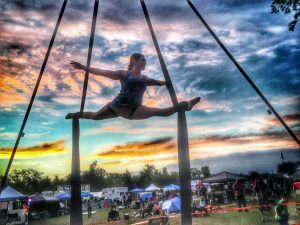 She is a force of nature who teaches multiple aerial arts at MCS, including aerial pole, aerial yoga, and silks. 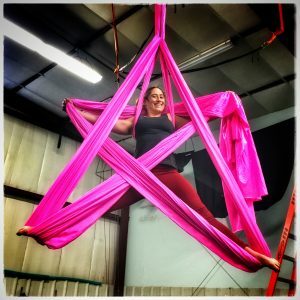 Luv brings training in such diverse areas as modern dance, diving, circus arts, Pilates, and contact improvisation to her aerial performance, teaching, and choreography. 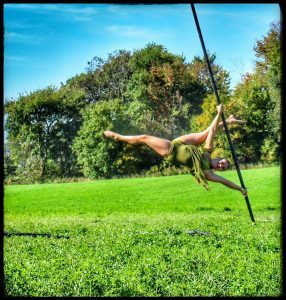 In addition to her work as a collective member at Cycropia Aerial Dance, Luv has been a member of LAVA Dance Collective, an improvisational dance company that currently tours the U.S., since 2001. Luv has a MA in dance/movement therapy. When not flying, she can be found at one of her many jobs, instilling the healing power of movement expression to children and adults.